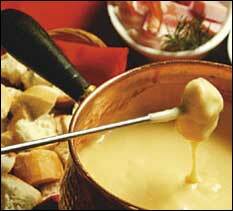 For over two decades, my family and I have enjoyed fondue together as one of our winter traditions. We tried it once as an experiment, and the concept stuck. It’s not hard to see why: fondue is fun. Traditionally an alpine après-ski experience, it was co-opted by Americans in the 1970s as the ultimate winter party fare. Whatever your take on fondue, whether it includes delicate vegetables and European fromage or yellow cheddar and Lit’l Smokies, a pot of melted cheese pairs well with wine and promises to please a crowd. It’s also one of the few times etiquette requires that we play with our food! There are plenty of articles and books describing the perfect fondue technique (twirl the long prong to gather up those cheese-strings, keep a separate fork on hand for eating to avoid contamination of the pot). But rules, of course, are meant to be broken. Only one fondue law remains unchallenged by all known sources: if you drop your cheese-vehicle (be it apple, sausage, or bread) into the pot, the person next to you gets a kiss. With this in mind, it may be worth strategizing on that seating arrangement! While you can spice up any fondue recipe with herbs, shallots, sharp or blue cheeses, or liqueurs, we prefer this straight-forward, traditional recipe that allows the subtle flavors of the Gruyère and Emmental to shine. Mix the grated cheeses together in a bowl and toss with cornstarch to lightly coat. (This will prevent cheese from separating from the wine). Take the garlic and rub it on the insides of the fondue pot. When the pot has been sufficiently coated, discard the garlic. Over medium heat on the stove, simmer Chardonnay gently, gradually stirring in handfuls of cheese, allowing it to slowly melt. Use a whisk to mix. Add cracked pepper and a sprinkle of sea salt. When combined, remove fondue pot from stove and place on a stand over a butane canister or several tea lights. (Note: texture should be creamy and thick, not stringy or runny.) Use skewers to dip sides into the cheese. Pair with the remaining Chardonnay in the bottle. What are your winter traditions? Please share them with us on Facebook!